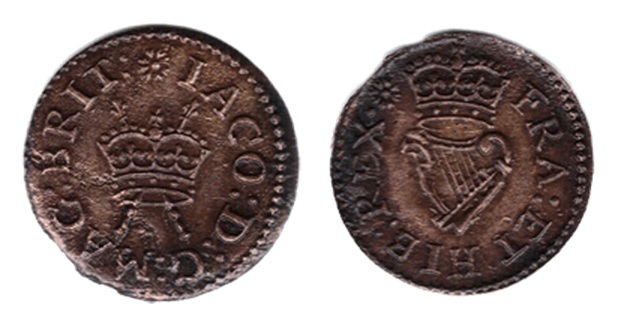 Strictly speaking, “most” of the Lennox ‘patent’ Farthings are not part of the Irish coinage of James I but, since many turn up in Ireland (either as genuine finds, or as imports by collectors or dealers), they cause a lot of confusion due to their having a harp on the reverse. Also, this patent was carried through by no less than four patentees – the second (Lennox), third and fourth of which did produce farthings ‘authorised’ for use in Ireland upon continuation of the original patent first granted to Lord Harrington. 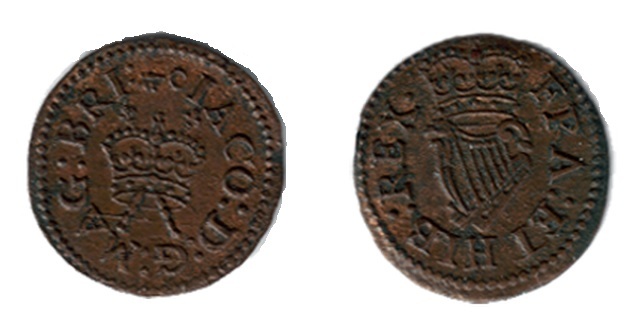 Due to a shortage of small coins, James I authorised John Harrington to issue tin coated bronze farthings in 1613, and three main types were minted – the last being a slightly larger copper farthing without the tin coating. 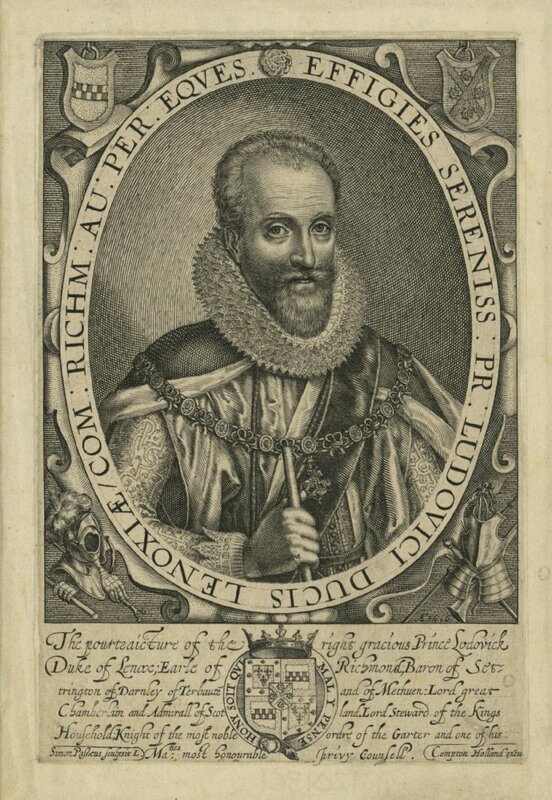 When Lord Harrington died in 1614 the patent passed to his son, who died soon thereafter, so the patent reverted to Lord Harrington’s wife, Lady Anne Harrington. It appears Lady Harrington either sold or gave the patent to the Ludovic Stewart, 2nd Duke of Lennox on June 28, 1614. The Duke of Lennox became the Duke of Richmond, but died around 1624. 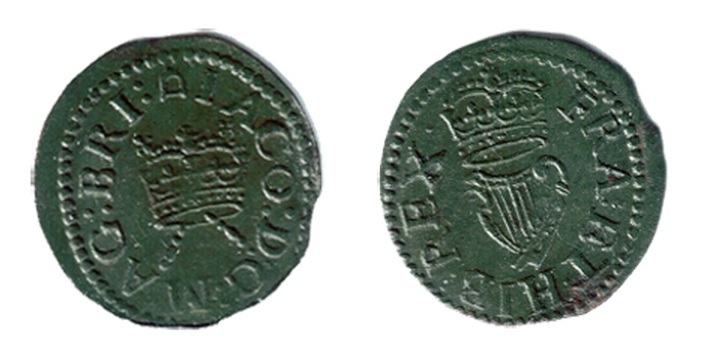 Thus the Harrington and Lennox farthings date to the reign of James 1 (1603-1625). The patent title passed jointly to Ludovic’s widow Frances, Duchess of Richmond and Sir Francis Crane who had their patent re-affirmed by Charles I. These (subsequent) issues would be known as the Richmond Farthings. Type 1 : Made with new type dies with IACO starting at 12.00 o’clock instead of being between the sceptre heads. The harp now has an eagles head in its design. Die axis varies between upright and rotated. 6 or 7 harp strings occur. Type 2 : Another new design with the privy marks appearing on both sides of the coin. At the beginning of the legend on the obverse, and at the end on the reverse. Again 5 circlet jewels, and 6 or 7 harp strings are found. Die axis variable. Type 3 : Farthings of this numerous group have the privy mark on the obverse only – at 12.00 o’clock. 5 circlet jewels either side. Usually 6, occasionally 5, and extremely rarely,7 harp strings. 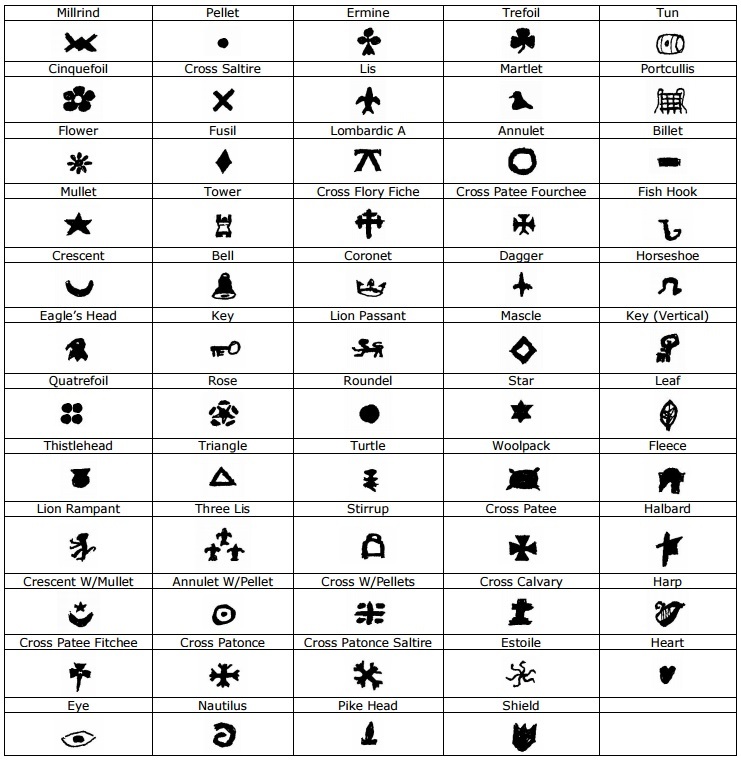 Privy marks recorded are – lombardic A, annulet, coronet, cross flory fitchée, cross patée fourchée, dagger, eagle’s head, fusil, key (horizontal), lion passant, lis, mascle, quatrefoil, rose, roundel, thistle head, trefoil, triangle,tun, turtle, and woolpack. From this issue onwards, many counterfeits occur. Type 4 : Nine circlet jewels either side. Eagle-headed harp with 5, 6 or 7 strings. Die axis varies. Privy mark at 12.00 o’clock on obverse. Known privy marks are – lombardic A, dagger, fusil, lion rampant, lis (3), mascle, stirrup, trefoil and triangle. Type 5 : Five circlet jewels either side. Legends either side now start at 7.00 o’clock. Privy mark (cross patée) at start of legend on obverse, and at end of legend on reverse. 6 or 7 harp strings. Die axis rotated. Obverse legend reads IACO;D;G;MAG (or MA:) BRI (or BR). 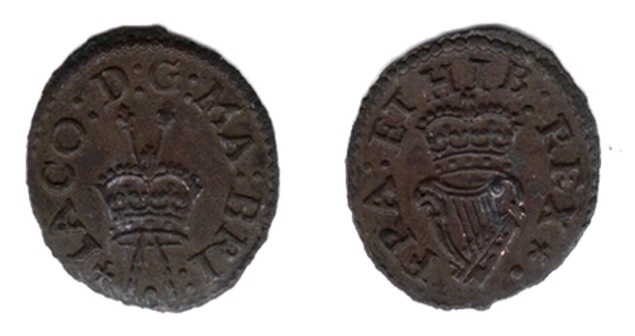 In line with the previous patent farthings, the Lennox Farthings included a series of Privy Marks which were an additional device to prevent / deter counterfeiting. Who was Ludovic Stewart ? Ludovic Stewart, 2nd Duke of Lennox and 1st Duke of Richmond (1574–1624), was a Scottish nobleman and politician. He was the son of Esmé Stewart, 1st Duke of Lennox, and his wife, Catherine de Balsac. From an Irish perspective, Ludovic is perhaps best known for his involvement in the Plantation of Ulster, where he was granted lands at Portlough in the Barony of Raphoe in County Donegal in 1608. The Pynnar Survey of 1618 records the Duke of Lennox as being the chief undertaker for 2,000 acres in the Portlough area and as being represented locally by his agent Sir Aulant Aula, Knight. It is likely that Newtownstewart in Co. Tyrone is also named after him. In the Muster Rolls of 1631 the 4th Duke of Lennox is described as being an undertaker of 4,000 acres. He also participated in the colonization of Maine in New England. Richmond’s Island and Cape Richmond, as well as Richmond, Maine (formerly Fort Richmond), are named after him. After the death of his mother, Ludovic returned from France and was taken to meet James VI at Kinneil House who issued instructions for the education of Ludovic. The young Duke was to remain in the king’s household under the care of Mr. Gilbert Moncreiff. In 1591 he was appointed to the post of Lord High Admiral of Scotland following the disgrace of Francis Stewart, Earl of Bothwell. He then married Jean Campbell, great-granddaughter of James IV of Scotland, ca. August 1598. He acquired the licence to mint copper farthings. In 1623 he was granted the additional titles of Earl of Newcastle and Duke of Richmond. He died in 1624, aged 49 and was interred in Westminster Abbey, London.